Four-plus decades have given ambitious AV pros time to proceed past that classic, where filmed singing headshots were projected onto statues of their faces. Today’s adventurous retail displays, the ice at an NHL game, the exterior wall of a big building, or even the entire outside of the Sydney Opera House are fair game for civic projects and sponsors making a statement. An example of projection mapping on an unlikely surface—the exterior of a yacht. While the core technology for accomplishing projection mapping are projectors and powerful media servers, an open mind to fresh concepts is equally essential. “At Christie, we talk of putting pixels everywhere—projection mapping is a visualization of this,” said Mike Garrido, senior product manager, for California-based AV solutions provider Christie Digital. “As people get more experience or exposure to what’s possible, the surfaces can become almost anything. We’ve seen projection mapping on cliffs, on the San Mateo County History Museum in Redwood, CA, and in banquet halls where projections aren’t just on walls but on tables—the tablecloth becomes a screen, and the effect is quite impressive. As the venues and expectations expand, so do the capabilities that AV integrators must have at the ready. According to Ken Showler, support director for media serving solutions provider 7th Sense Design, an accurate 3D calibration is key as the toolsets for accuracy and speed of calibration improve. “You can kill yourself yanking pixels around, often fighting the unavoidable inaccuracy of the real world versus the ‘perfect 3D virtual world’ that the artist prepares their media show in,” he pointed out. “You have to roll up to the site with all the tools you can to deal with this, and of course, a whole lot of experience in the craft helps. Christie’s Garrido emphasized the importance of the content provider. He noted that in a large civic project, talented artists are often discovered via an open call for submissions. But if it’s up to the AV integrator to hire an individual, they must be able to look ahead to the end result. When the latest techniques and components are gathered together, practically anything seems possible. As just one example, Stumpfl pointed to the use of AV Stumpfl show control, multimedia, and screens throughout Bronze Age Cinema, an installation in Austria’s famous Salzwelten salt mine, in the natural Dachstein limestone bedrock of the Hallstatt Mountain Salt Mines. Down 400 meters under the Earth, AV Stumpfl FHD Players are driving content to three Canon XEED WUX400ST short throw projectors that are edge blended. After an initial five-minute film is shown on a motorized screen, the screen moves to reveal Europe’s oldest wooden staircase, followed by a two-minute holographic projection show that uses a fourth projector beaming onto the rock wall to create a three-dimensional effect. While the natural surfaces of the mine add visual interest to the film, this installation—like many others—had a location-specific challenge that needed solving: the soft salt rock and surrounding limestone cause a shift of several centimeters each year. As a result, all projectors are installed on a truss traverse, and changes are compensated for via adjusting screws and re-stretched screens. Interactivity in projection mapping is now becoming easier to implement because of apps. Everyday people can take part in affecting what thousands of others see, by downloading an installation-specific app into their phone or tablet, and joining in on big fun. For AV integrators looking to be part of a breakthrough project, projection mapping is just the ticket for getting attention and partnering with fresh talent in the process. “Almost any content creator is just chomping at the bit to get involved,” Garrido says. The ever-increasing brightness and resolutions of today’s projectors, coupled with the technology to blend multiple images together into one picture have allowed for creative engineers to turn almost any surface, of almost any size, into an engaging, high on wow-factor digital display. Here’s a selection of some of the more compelling installations in which top projector brands were put to work to create captivating experiences unimaginable just a short time ago. Electronic Opus, a creation of TanZ Group and Video Games Live creator Tommy Tallarico, is a melding of minds across mediums—a symphony orchestra blended with electronic instruments, soaring vocals, a giant innovative hardscape, and brilliantly shapeshifting video—culminating in an immersive sensory experience. Transcending the boundaries of each musical genre, Electronic Opus blends classical and electronic musical styles, appealing to a broad spectrum of demographics and musical tastes. Tying it all together was a stunning interactive 3D projection mapping show that fully enveloped the audience in a kaleidoscope of dynamic sight and sound. To create the innovative stage show, interdisciplinary new media design studio Volvox Labs designed and built a 52-by-13-foot topographic wall as a video mapping surface to represent a “physical manifestation of the animated worlds and a wormhole to different dimensions.” Barco provided three RLM-W14 large-venue projectors and short-throw lenses to power the custom sound-driven visuals, which transport the audience on a journey through space and time. At Singapore’s Golden Jubilee, Christie’s valued partner, Hexogon Solution Pte Ltd, used Christie projectors to set a new Guinness World Record for the greatest light output in a projected image ever produced in a single event. More than 120 Christie projectors, including the Boxer 4K30 and Roadster HD20K-J, displayed rich and colorful multimedia content, including 3D effects, that enhanced the scale and grandeur of the celebrations befitting of Singapore’s Golden Jubilee, also known as SG50. This is the first time Christie Boxer 4K30 projectors were used for a national event in Singapore since launching in January 2015. To project onto the Karlsruhe Palace, which measures 180 meters wide by 20 meters high, 24 Panasonic three-chip DLP projectors were rigged in two towers 80 meters away from the façade. The organizers tripled the number of projectors used, as the opening night was so close to the summer solstice. And because the audience was very close to the castle, the projection surface had a resolution of almost 11K (10,800 by 1080). Seeking to stay up to date in a constantly changing local community and a mediadriven generation, Evangel Church in Long Island City, NY, recently turned to Hitachi’s CP-WX8265 and CP-X8170 projectors to bring the church into the modern age. As keeping the attention of the younger generation continues to be a challenge, Andrew Marko, director of operations and technology, looked to Hitachi to help bridge the gap for the 1,300-person church. Based in Kunming, the capital of Yunnan Province is a new commercial and tourist complex. Colorful Yunnan—The City of Flowers complex has a floor space of 240,000 square meters with the main attraction being the Atrium in the project’s main exhibition space. Located here is an immersive dome measuring 28 meters long, 15 meters wide and 4.8 meters high, which is currently Asia’s largest elliptical dome. The Dome can accommodate 600 visitors at a time who are immersed in stunning natural scenery from the surrounding areas. 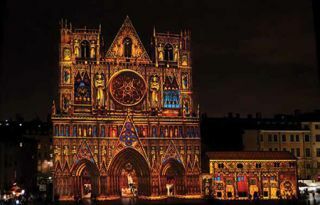 It uses 14 edge-blended HIGHlite Laser projectors to illuminate the huge surface area with 10 projectors used on the perimeter and four on the cap. The video content runs in a 15-minute loop and operates 12 hours per day. For this reason, the venue needed projectors with a long-life light source to ensure smooth running of the attraction. The HIGHlite Laser was chosen due to its 20,000 hours of illumination and associated reduction in maintenance and downtime costs when compared with traditional lamp-based projectors. Twenty-six Christie Roadster HD20K-J and 12 Christie Roadster S+22K-J projectors were used for the “Projecting Change” display in New York City. New York City’s skyline received an environmental makeover on August 1 with an animated display of the world’s most endangered animals projected onto 33 floors of the Empire State Building. This show, titled “Projecting Change: The Empire State Building,” uses images of endangered species, including manta rays, birds, reptiles, lions, and a gorilla that “climbed” to the top of the building, as a way to spread awareness about our role in protecting these animals and to promote the upcoming documentary, “Racing Extinction,” by the Oceanic Preservation Society. “The story we were trying to tell was something that no one really knows, and it’s that we’ve had five mass extinctions (in the Earth’s history). Now we’re rolling into a sixth, and man is the cause,” explained Travis Threlkel, chief creative officer with Obscura Digital, the design firm tapped for the project. The entire project was a collaboration between Threlkel and Oscar winning filmmaker and photographer, and executive director of the Oceanic Preservation Society, Louie Psihoyos. Pedestrians photograph a leopard projected on the Empire State Building as part of the “Projecting Change: The Empire State Building” project. Projecting Change occurred in three parts, starting first with a mobile Tesla car that projected video, followed by a projection project on the United Nations building in New York City for Climate Week back in 2014. The grand finale was to project these animals onto a high profile structure—the Empire State Building. Threlkel said it took Obscura and the Oceanic Preservation Society nearly four years to get everything together for the event, working with the Empire State Building and the New York City government to secure all the permits to make this happen. On August 1, 2015, these efforts became a success as images of endangered species were projected onto the Empire State Building from 9 p.m. to midnight. The display measured 375 feet high and 186 feet wide, projected onto the iconic skyscraper using 26 Christie Roadster HD20K-J and 12 Christie Roadster S+22K-J projectors, provided by Nationwide Video. Obscura built weatherized steel turrets to hold the projectors, and used their own custom blending software. “Really our challenges were with the scale and the building and surface material,” Threlkel said. “We weren’t sure how the materials would react, but luckily it worked a little better than we thought.” Threlkel was referring to projecting onto a building with so many windows, many of which would still be lit during the event, along with competing with lights in Midtown Manhattan. He said they were expecting the images to be dim, but luckily the final images were much brighter than they expected.